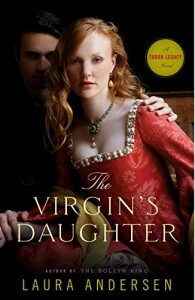 The Virgin's Daughter follows Andersen's excellent Boleyn Trilogy, which is now styled as The Tudor Legacy series to accommodate more stories. You really should read the first three books before this one, though as it stands by itself you won't be too lost. It's best, though, to start from the beginning to get a better sense of the alternate history Andersen writes. The title is sort of a misnomer, because you get the impression Elizabeth's daughter, Annabel, is the focus of the story. She has a significant role, but the heart of the story centers more on Lucette Courtenay, the daughter of Elizabeth's old friend Minuette, and her family's involvement in uncovering plots connected to the Queen and Mary, Queen of Scots. If you love Tudor fiction, this series offers an intriguing "what if" scenario to the history. I look forward to the next one.